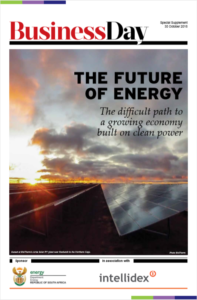 Intellidex has produced two groundbreaking publications on the energy sector, distributed as pullout supplements in Business Day, driven by high quality editorial and photography. Both received wide acclaim and had a dramatic impact, being read not just across South Africa but internationally too.The first, Five Years of Renewable Energy, was produced in 2016. It celebrated the country’s incredible success in establishing a brand new industry from scratch, with no hint of corruption. The bidding process, conducted with professionalism by the IPP Office, a division set up by the energy department and National Treasury, succeeded in driving costs down and was duplicated by numerous other countries. The second publication, The Future of Energy, is more forward-looking, analysing the path the country has chosen to follow through the revised Integrated Resource Plan 2018. 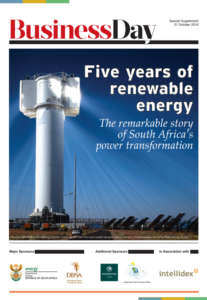 But it was also celebratory: it was published in 2018 and in between the two publications, SA’s renewable energy sector had been through a tortuous process with politics nearly stunting any further growth. The IRP put renewable energy back on a growth path. While many difficulties remain, we are optimistic that the Renewable Energy Independent Power Producers Programme will help achieve a trifecta of wins for South Africa: lower cost energy, lower carbon emissions and employment. Click to download the full publications: Five Years of Renewable Energy and The Future of Energy.